3 What is the Bhasmasur story? 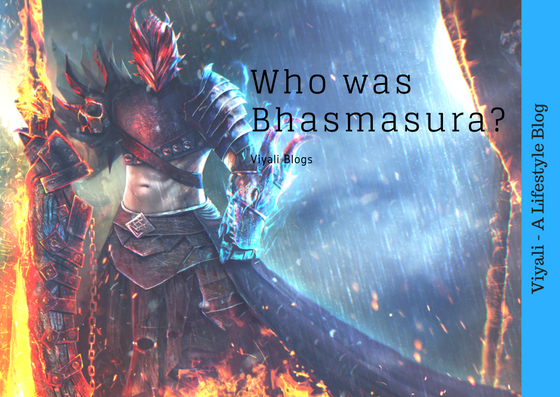 If you are curious to know about who was Bhasmasura, and what was the Bhasmasura story? In this post, we have described the story of Bhasmasura. Bhasmasur story explains the generosity of Lord Shiva. It is the story of a demon who burns himself after getting the boon from the great lord. The story of Bhasmasura gives a significant moral lesson to everyone that you cannot attain Siddhis without overcoming your inner darkness like ego, passion, anger, illusion, lust. If you still try to get siddhis without awakening spirituality within you, these Siddhis will burn you out. What is the Bhasmasur story? Once upon a time, there was a demon named Bruk, he was the son of Shakuni. Since Bruks birth, he was a foolish son to his father. Due to his stupidity; he always kept creating problems for his father. One day his father scolded him that he will never achieve success in his life. Bruk realized that his father never expected him to become successful; so he decides to prove his father wrong that he is not a foolish son to his father. He was desperate to prove himself a successful, but he had no idea how to do that. Then one day he meets with sage Narada who listens to his problem and advised him to penance upon Bholenath. Narada tells to Bruk that if his penance gets successful, you will prove your father wrong. Bruk accepts the advice of sage Narada and starts searching for a peaceful place for himself where he could meditate upon Lord Shiva. After a long search, he finds a rare place covered with hills. He decides to choose that place for his austerity and starts his penance. Many years get passed, One-day Brahma and Vishnu meet Shiva at Mount Kailash. Lord Narayan tells to Lord Shiva that time has been come to bless a boon to demon Bruk. Lord Shiva gives his consent that Bruk got a chance in his life. ; now he has to decide for himself. Mahadev further elaborates that if a devotee's feeling is genuine for his lord, then he doesn't require any boon. Lord Narayan agrees on that and Shiva goes to meet Bruk. Brahma asks Lord Vishnu are you ready, Narayana? Lord Vishnu tells that Yes, Lord Brahma, I'm ready. Lord Shiva appears in front of the demon Bruk and requests him to open his eyes. Demon Bruk gets delighted to see his lord in front of him. Bruk falls into the feet of Shiva and starts weeping. Shiva informs Bruk that he has successfully performed his penance. Now he has the right to ask anything from Shiva as the boon. Bruk tells to Shiva that his father always treated him as idiotic and failure son, but today he could tell his father and other people that he has got successful in his penance. Lord Shiva asks Bruk to request something in return of his penance. Demon Bruk gets overwhelmed for a moment; and thinks what is the most precious in life? Bruk tells Shiva that he need some moment for himself so that he could think properly. Shiva accepts demon request and sits over a rock there and let Bruk think about his wish. The demon tells to Shiva that he has no idea what kind of boon he should ask from Shiva? Shiva advises demon that he can make him intelligent if he wants. Bruk refuses the advice of Shiva by saying that he already proved everybody wrong. Bruk tells Shiva that everybody should fear him. He needs some special power which no one ever had. Demon request Shiva to bless him with the power to turn anyone into ashes; as soon as he puts his hand on others' head, they should get burn and turn into ash. Shiva gives the blessing to the demon, but the Asur tells Shiva that he will examine Shiva's boon. Shiva tells that he is sitting there, till Bruk returns. Asur goes to the jungle and sees some animals like buffalo and puts his hand on their head. Buffalo immediately turns into ashes. Bruk realizes that Shiva has given him a definite boon. Now, Asur decides to test the boon on humans. Bruk goes into the ashram and sees rishis performing Vedic rituals. Bruk puts his hand into sages head and burns them out. Immediately, sages turn into ashes. One of the sage says Bhasmasura is here, save your life. Bruk hears the shout of sages and likes his new name Bhasmasura. Then he decided to test the boon on devas (demigods) and appears on Swarg(heaven). Demigods get scared after seeing Bhasmasura there; they run out from the Swarga. That gives happiness to Asur Bhasmasura. It was the first time people were noticing him and getting frightened of him. Now after conquering Swarga, he desires for a beautiful woman to whom he could share his success. Bhasmasura sees Goddess Parvati and thinks that he has to burn his Lord Shiva by putting his hand on Shiva's head so that he could be with Goddess Parvati. Lord Shiva was seeing everything, whatever Bhasmasura was doing. Asur returns to Shiva and gives thanks Shiva for the benefit. He tells Shiva that now he wants to take Mahadev's place and to do that he has to put his hand on Shiva's head. Shiva tells Bhasmasura that I hope you enjoyed your new powers. If you want to examine your new power on me, you are welcome Bhasmasura. I'm right here sitting on this rock. Bhasmasura starts running towards Shiva and Shiva closes his eyes and starts meditation. In the Dhyana Yoga Shiva reduces the speed of Kaal Chakra (wheel of time). The speed of Bhasmasura gets extremely low. Reaching up to Shiva becomes impossible for Asur. It was the perfect time for Lord Vishnu to appear in the back of demon Bhasmasura. Lord Vishnu appears in the appearance of a beautiful lady, and Shiva increases the speed of the Kaal chakra. As soon as time restarts, Bhasmasura hears the voice of a beautiful lady. He looks at her; She tells her name Mohini. Bhasmasura forgets about Shiva and tells to Mohini that She is a beautiful lady, why don't she becomes his queen. He introduces himself by the name of Bhasmasura. Mohini tells Asura that he seems to be super strong, but he cannot impress her with his power. A man who could perform precisely the same mudra (position) in dancing as she does, could win her heart. Bhasmasura gets agree, Mohini starts dancing. After watching her dancing; Bhasmasura starts following her dance moves. Bhasmasura was enjoying every dance step which was matching exactly with Mohini. At last Mohini puts the right hand on her head and Bhasmasura also does that as a result, Bhasmasura gets burn out and turns into the ashes. That was the Bhasmasura story. In this post, we have described who was the Bhasmasura and what was the Bhasmasura story. If you liked the post, please feel free to share the post with others on Social media. For more such post, you can like our blog Viyali Facebook page. You can also follow us on Twitter. Finally, please keep smiling and stay happy.